A family discovered that they have a den of foxes living on their property, and they decided to set up a GoPro mini-cam to see what they get up to, and the results are hilarious! These animals are very social and live flexible lives. They are found all over the world — in North America, Europe, Asia and North Africa — and call a wide range of terrains their home. They also eat a greatly varied diet. Foxes are very social creatures that live in packs. A group of foxes are called a leash, skulk or earth, according to the U.S. Department of Interior. They are also called packs. No matter what you call them, foxes like to stick near family members. A pack may include older siblings, pups, foxes of breeding age, mates and mothers. These mammals like to hunt at night and are nocturnal. This means that they sleep during the day. This can change, though, depending on where the fox pack lives. If they live in a place where they feel safe, a fox pack may hunt during the daytime, according to National Parks and Wildlife Service of Ireland. Foxes have great eyesight. They can see just as well as a cat, in fact. Their eyes are much like a cat's thanks to their vertically slit pupils. Foxes are also very fast. They can run up to 45 mph. That is almost as fast as the blackbuck antelope, one of the world's fastest animals. 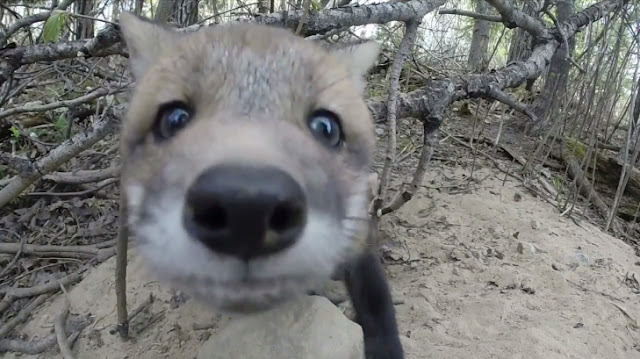 Responses to "Baby Fox Discovers a GoPro Camera and Tries to Pounce on It"